Coca Cola moving out of Plachimada? The Coke saga in Kerala took a new twist towards the end of 2005 when the company expressed its interest to shift out of Plachimada to a nearby industrial estate where water consumption may be less contested. Meanwhile, the tussle between Coke and the Perumatty Panchayat awaits resolution at the Supreme Court, reports P N Venugopal. Adding a new dimension to the ongoing tussle between the people of Plachimada and the soft drink giant Coca Cola, the company has expressed its willingness to shift its plant from the region governed by the Perumatty Panchayat in Kerala. The Hindustan Coca Cola Beverages Pvt. Ltd made this proposal in a letter addressed to the Minister for Industries, Kerala, in late November 2005. The proposed site, about 40 kms away from Plachimada and is in the Kanjikode Industrial Estate, also in the same Palghat district. The company has demanded at the new site, "a confirmed resolution for meeting the infrastructure needs such as water and electricity along with an amicable environment devoid of the problems as have been faced in Plachimada." Subsequently, a meeting was convened by the Industries Department on the 3rd of January. It was attended by the representatives of Perumatty Panchayat, the District Industries Centre, Palakkad, Kerala State Pollution Control Board (KSPCB) and Coca Cola. Perumatty Panchayat, it is reported, did not have any objection to the company being shifted. No decisions were reached in the meeting and there will be further discussions in the coming months. Meanwhile, following dictates of the Kerala High Court, [see box on Plachimada Saga] on 4 January 2006, the panchayat renewed Coke's license for three months and laid out thirteen conditions. The first of these is that the company shall not use groundwater from Perumatty Panchayat for industrial purposes, or for producing soft drinks, aerated carbonate beverages or fruit juice. The local body quoted two documents in support of its stance. The second document the panchayat cited was the notification by the Kerala State Groundwater Department which declared Perumatty Panchayat along with four other panchayats in Kerala as 'over exploited' with regard to groundwater. The Panchayat also quoted its own resolution of a fortnight ago, which stipulated that in view of the acute shortage of water neither surface water or groundwater can be used for any purposes other than domestic and agricultural. According to activists, the area has not experienced any water scarcity and the company does not cause any pollution as such. Effectively, the panchayat was renewing Coca Cola's license, but not allowing it to draw a drop of water. Two other stipulations made by the panchayat. One, it asked Coke to reveal the components used for making the soft drink in order to ensure that no hazardous items are used and two, it asked Coke to ensure that cadmium or other chemical pollutants are not taken out of the factory. As the people are being supplied drinking water in tanker lorries from outside, the panchayat also asked the company to arrange for supply of one lakh litres of water everyday. It has also asked Coca Cola to implement the social security measures as suggested by the High Court within a period of one month. As could be anticipated, the company rejected the conditions as impractical and not keeping with the spirit of the various High Court orders. It claimed that it has the right to tap the water sources within its premises and also quotes the High Court order permitting it to draw 5 lakh litres of water per day. The company also refused to reveal the components of its soft drink claiming that no poisonous or hazardous items including cadmium are present in it. It expressed its willingness to get the drink examined in any laboratories suggested by the panchayat. The company also further averred that no waste from its plant is taken outside and arrangements have been made to treat them within the factory premises. It asked for details of the social security measures to be implemented and requested for a discussion on the issues within 15 days. This is perhaps an indication that the company will try its best to remain at Plachimada itself, despite the proposal to shift. The company has made it amply clear in the letter to the Industries Minister and also in the discussions that relocating will be a last resort. Their letter to the minister said: "
does not wish to relocate the plant if alternate proposition to sort out the various issues being faced by the company in their present location are explored favourably by the government." However, Coca Cola has requested the government for sales tax concessions and also for "other applicable beneficial schemes" to offset the additional expenditure involved in shifting base. An interesting aspect of the proposal is that the Kanjikode industrial estate is in the Puthussery Panchayat from where Pepsi Cola is operating without many hassles, at least for the time being, even though those opposing it are gathering forces. However, it is a notified industrial area within the purview of Kerala Industrial Development Act and also within the meaning of Kerala Panchayat Raj Act. Hence the likelihood of their being any legal tangles for either Pepsi or Coca Cola - if it is shifted - is remote. March 2000 - Factory established. April 2002 - Agitation commences. March 2003 - Panchayat refuses to renew license. May 2003 - State government stays the panchayat decision. Dec 2003 - Single judge bench of the Kerala High court upholds the panchayat's decision. March 2004 - Coca Cola factory shut down on Kerala government's orders. April 2005 - A High Court Division Bench allows appeal by Coca Cola and permits the company to draw 500,000 litres of water per day. Orders the panchayat to renew license. May 2005 - Panchayat files special leave petition in the Supreme Court. 1 June 2005 - Company approaches the High Court again as the panchayat did not renew the license. The court orders panchayat to renew the license within 7 days, or it would be deemed that the license stands renewed for two years from 10 June 2004. 6 June 2005 - Panchayat informs the company that license will be renewed for three months; asks them to remit the fee and collect license. November 2005 - High Court rejects the company's petition that since panchayat did not keep up the stipulated time frame, it should be deemed that the license stands renewed for two years. The company ought to have accepted the opportunity to function for three months. But the court again orders the panchayat to renew the license. 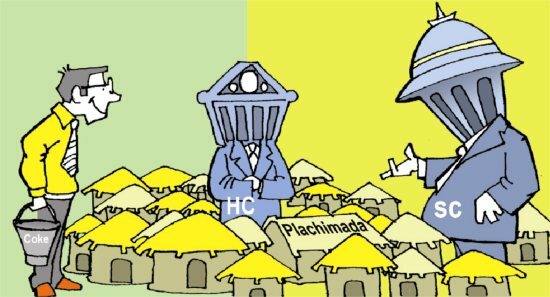 November 2005 - Panchayat files SLP against the latest High Court order in the Supreme Court.  Save groundwater, ground d'cracy? At the same time, everything about the Kanjikode Industrial Estate does not appear to be above board. The Kerala government has recently published a document which is to be the basis for all future groundwater utilisation in the state. "The Dynamic Groundwater Resources of Kerala As On March 2004" has been jointly prepared by the Groundwater Department of Kerala and the Central Ground Water Board. The report is a reassessment of the groundwater resources and its present utilization, block-wise and also classifies the blocks as 'safe', 'critical' and 'over exploited.' It is based on this report that 5 blocks including Chittoor block have been declared 'over exploited.' Plachimada falls in the Chittoor block. However, the report has not disaggregated commercial water usage at the level of individual firms (commercial consumers of water) in the various blocks. There are concerns about the report itself. Because the current groundwater usage figures are not available, the report has gone by projections based on the average increase in use for the period 1992 to 1999. Some data could be considered stale, and this raises questions on the reports conclusions and assumptions. However, it's not as if all the data are stale. The report's findings are also not a mere repetition of earlier figures. And what is astonishing is that the report has left out one block out of the total 152 blocks of the state and that block is Malampuzha block. Kanjikode Industrial Estate and Puthussery Panchayat are in Malampuzha block. As noted earlier, this is where Pepsi and a number of others water reliant firms are operating and where Coke proposes to move to as a last resort, and it is very difficult not to attribute motives. The reason given in the report for this omission is that Malampuzha block is a 'new' one and hence required data is not available. However, Malampuzha block was formed in 1990 and it is unbelievable that data is not available. Even though it cannot in anyway be taken for granted that the soft drink giant is shifting from Plachimada, the anti Coca Cola agitation committee led by Velur Swaminathan has already demanded that Coca Cola adequately compensate the damage done to the people. Apart from the contention that Coke caused water scarcity, the company had distributed hazardous sludge to gullible farmers as fertilizer polluting water bodies. The committee also criticized the government for helping the company to relocate within the state. However, Perumatty Panchayat President Risha Premnath said that no formal demand for compensation has been made till now. An oral submission was made in the meeting, but there were no discussions on it. There are 5 Special Leave Petitions (SLP) pending at the Supreme Court, challenging various High Court judgments. Three were filed by the panchayat and one each by the Kerala Government and the KSPCB. All of them will be bunched and heard together, said Advocate K Ramkumar, counsel for Perumatty Panchayat. But the SLPs have not been listed, as yet, so hearing dates are not available. Asked about the M C Mehta vs Union of India judgment not having a bearing on the High Court's Division Bench proceedings, Ramkumar said that, "This omission too has been questioned in the SLP." There is another curious angle to the litigation at the High Court. All the petitions filed by Coca Cola in the Kerala High Court are being heard by a bench comprising of the same two judges -- M Ramachandran and K P Balachandran. Queried about this, Ramkumar said: "It is very unusual. The panchayat had filed a written complaint about this to the Chief Justice. But no action was taken. Again, I had very clearly objected to this in the counter affidavit filed in the latest case which was decided on the 16th of November." P N Venugopal is an independent journalist working for Quest Features & Footage, Kerala.